Looking some fun dog activities for the holiday? Here are 5 ways to create great dog holidays. Many places, including pet stores like Petsmart and Petco, as well as various humane societies, offer pet pictures with santa. This makes a great holiday gift and activity for the Christmas season. Most of these events will take pictures with all pets, though it's the perfect idea for you and your dog. Your dog might feel a little left out while the family sits down for Thanksgiving and/or Christmas dinner. To fix this, try giving your dog a special holiday dinner of his own. Before creating a holiday dinner for your dog, it's important to recognize that not every holiday dish is good for your pet, so you can't just simply give him table scraps. Try instead to make him a special holiday treat, or give him a nice Kong with some dog food along with some boneless, skinless turkey. 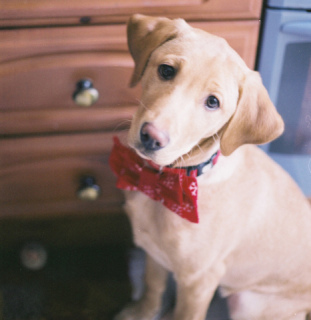 For ideas, try reading Top 5 Thanksgiving Treats For Your Pet. Though teaching your pup to unwrap his own presents may not be the safest idea, you can give him presents for Christmas so he can join in on the holiday festivities. If your dog isn't prone to bothering the Christmas presents, you can place them under the tree with the other presents until Christmas day. If he is, why not put them in a stocking out of his reach? When Christmas comes, your dog can enjoy presents with the rest of the family. Try taking photos of you and your dog during the Christmas season, under the Christmas tree and around holiday landmarks for instance, to create good memories of the holiday season. This gives you an excuse to explore a variety of places with your dog and collect photographs to help you remember the holiday season. 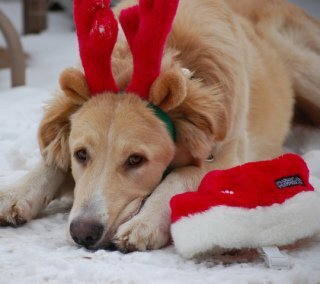 Owners often become less motivated to exercise with their dogs during the holiday season because of the weather. However, it may be a good idea to fight the urge to sit around during the holidays and get out with your dog. This way, you'll both be well exercised and it will do you both some good. Special trips with your dog are great as well, and they'll be very much appreciated during the holiday season. With these fun holiday activities, your dog will be able to enjoy this special time of year along with you. Be sure to take careful consideration of what's safe for your pet and what's not.